We all have something very valuable that we are afraid to lose. As a cloud-based web development platform, Wix's users entrust both their valuable data and creative process to them for their web presence. Wix absolutely cannot afford to have a ‘Oh no! It’s gone!’ moment. To meet this challenge, Wix replicated their services to Google Cloud Platform. 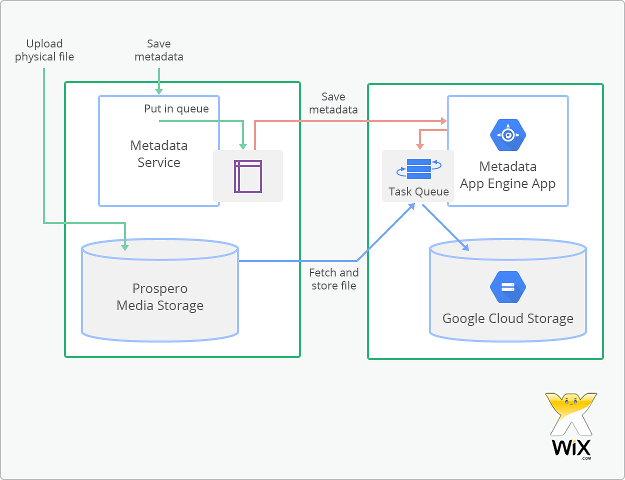 By weaving together their own managed hosting cluster and Google Cloud Platform, the data is replicated across two different systems, making it robust against both data loss and poisoning. Eugene Olshenbaum, the Head of Media Services group at Wix, wrote a technical case study to describe how Wix replicated their services to Google Cloud Platform, which is available here. Here are some of the highlights from the case study. Ease of management - App Engine eliminates the need for system management. Scalability - App Engine automatically scales with the volume of the requests. Speed of development - App Engine provides all the technology building blocks for application development. In the case study, Eugene described the high level architecture of the Wix media serving system and how each component took advantage of the features provided by Google Cloud Platform. He addressed the replication system between the two systems in details as depicted in the following diagram. When it comes to building a robust and fail-safe system, careful planning and design are required. By using Google Cloud Platform, Wix was able to develop a functional system ready for integration test -- all in two weeks. Read more about their solution here.